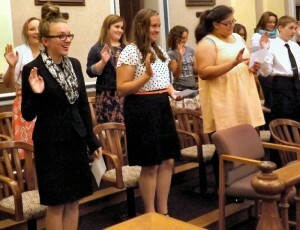 OSWEGO, NY – Nineteen students from around the county were sworn in this week as the newest members of Oswego County’s Youth Court. Oswego County Legislature Chairman Kevin Gardner administered the oath at the Oswego County Courthouse on Oneida Street as members of the graduates’ families looked on, many of them taking photographs. Declan Hawthorne receives his Youth Court diploma from Dawn Metott. Youth Court is a recognized community diversion program aimed at keeping young offenders out of Family Court, according to Brian Chetney, director of the Oswego City-County Youth Bureau. Dawn Metott of the Youth Bureau is one of the Youth Court coordinators. Youth Court is a national program that is nearly 40 years old; it’s 31 years old this year in Oswego County, she said. Oswego’s is the second oldest program in New York State. 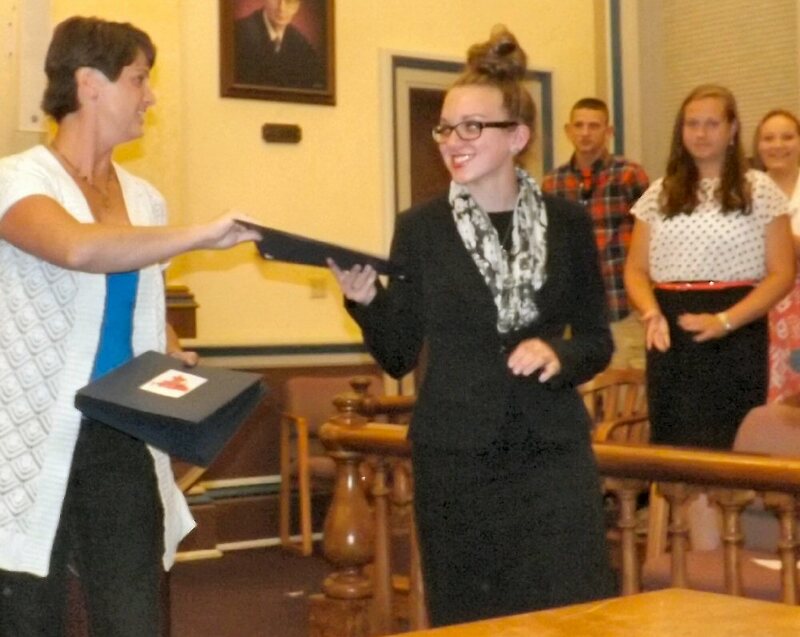 Oswego’s Youth Court has been around since the 1980s and was one of the few such programs in the country, she added. The goal of Youth Court is not just to punish the offenders, but to teach them a lesson and hopefully not get into trouble again, she said. Research has shown that youth who go through the Youth Court process “are very unlikely” to be repeat offenders. The program gives young offenders who stay out of trouble “a fresh start,” Metott said. Youth Court handles about 40 to 50 cases a year. It teaches young people a lot about fairness, she added. The court handles cases of youth from age 7 to 18. “I wanted to join Youth Court to see what it was like being a lawyer. Before I joined, I had planned to go to law school and when I found out about Youth Court I figured I would try. Youth Court has helped me make the decision that law school is that right place for me to go,” said Bailey Otter. Thomas Distin expressed the same sentiment. Abby Yurkon has her sights set on becoming a lawyer. Legislator Shane Broadwell, chair of the Human Services Committee (which oversees the Youth Bureau), praised the Youth Court members for their hard word and dedication. “The Youth Court program benefits Oswego County in so many ways,” Chetney agreed. It eases the financial burden on Family Court; it educates not only the members but also the offenders who have an opportunity to learn about the criminal justice system, be judged by their peers and be held accountable for their crimes, he explained. Chairman Gardner is the father of two Youth Court members. Several court members held a mock trial to show the public what takes place during a Youth Court session. Offenders can be referred through several agencies, Metott said, including: Oswego and Fulton PD, New York State Police, Oswego County Sheriff’s Department, Probation Department, town and village police departments as well as local school districts. Youth can be sent to the program for crimes such as unlawful possession of marijuana, disorderly conduct, petit larceny, trespass, making graffiti, criminal mischief and others. Community service hours are the most likely sentence. 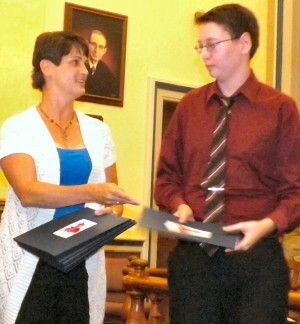 Others include writing a letter of apology or essay, restitution, attending programs at Farnham and others. All facets of the cases are held in strict confidentiality. Youth Court isn’t a fact-finding court, according to Chetney. Youth Court is a system, backed by police, where juvenile offenders who have committed a minor crime and have admitted their guilt are tried by their peers in a court of law. “Anything greater than a misdemeanor cannot be given to us,” he added. Hearings are conducted and punishments are imposed. Youth Court members are trained to become judges, defense attorneys, prosecutors and court clerks. Sixteen members are assigned a case; eight of them are potential substitutes in case someone can’t make it. Also, if one of the members knows the defendant, a different court member is assigned. The Youth Court process is strictly confidential. The goal of Youth Court is to prevent kids from continuing the behavior that got them in trouble in the first place. The advantages of Youth Court would be that defendants don’t have to pay lawyer fees, there is no record kept on file, and the most punishment they can have is several hours of community service and possibly reparation fees, Chetney said. Sentences are based on attitude of the defendant, age, outside circumstances, punishment received at home, and what was done to make up for his/her actions, Metott added. The purpose of the sentence is to deter the defendants from committing further crimes. When a defendant reaches the age of 16 (and they’ve stayed out of trouble), the Youth Bureau shreds the court files and the person’s record is clean. Members of the Youth Court class of 2014 are sworn in. If someone decides they don’t want to go through Youth Court, their case is kicked back to the arresting officer and then Family Court. Madeline Armet and Victoria Armet, Victoria Crissafuli, Kaitlyn Grant, Ruhma Khawaja, Taylar Clohecy, Elyse Maniccia, Alyssa Morley and Abigail Yurkon of Oswego; Jordan April of Hannibal; David Burgess, Declan Hawthorne and Bailey Otter of Phoenix; Thomas Distin, Katie Distin and Hayden Williamson of Fulton; Alexander Linerode and Cody Myers of Mexico; Hanna Lacrosse of APW. 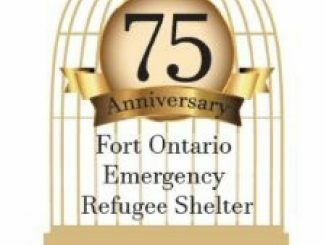 For more information on the program, call the Oswego City-County Youth Bureau at 349-3451 or 1-800-596-3200 ext. 3451.